Orpheus rubs shoulder with Dracula in scenes ranging from Brazil to Paris to New York in John Foy’s wonderful first collection of poems. Though the book has an exceptional breadth of reference, encompassing the most modern and the most ancient, the grandest and the humblest, the poems are unified by the surety of the poet’s voice. But don’t be deceived: the surface calm, hard won and sustained by superb craft, discloses a penetrating sadness in the heart of things. There is a strong, persuasive music to his poems that make them a delight to read. Even rarer, he has an instinctive sense of the magical, but it is a magic bound up with the earth, what he himself terms ‘a little divination, born of dirt.’ Techne’s Clearinghouse is a marvelous accomplishment and reveals what a poet of brilliance and insight can create with unobtrusive but compelling skill. In his impressive debut volume, John Foy proves himself a connoisseur of ‘delicate contrariety.’ Whether observing Brazilian folkways, superstitions, poverty, or eucalyptus trees, or meditating on tragedies ancient as Job’s or recent as the Challenger disaster, he holds in fine balance playfulness and philosophical gravity. With their formal resourcefulness and keen wit, the poems of Techne’s Clearinghouse delight the senses and engage the mind. Foy is a bold, genial, knowing guide on journeys to destinations as diverse as the galaxies, Ouro Prêto, and hell. A hundred years ago, Henry Adams offered a prayer to the Virgin and stanzas of ironic deprecation addressed to the Dynamo of the machine age. John Foy is caught up in the same crossfire, drawn toward Dante’s poetics of redemptive love even as his imagination is fired by Goethe’s drama of Fausitan modernity. Foy’s vivid evocation of rural Brazil recalls Elizabeth Bishop. 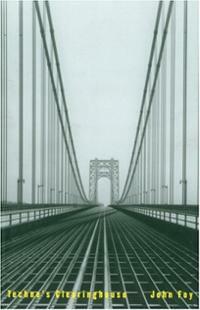 The title poem, addressed to the George Washington Bridge, alludes to Hart Crane. But other poets figure as well – Rilke, certainly, in the remarkable sequence “Rue des Martyrs,” which revisits the author’s years in Paris. Sophocles, Donne, Frost, and Williams, all have shaped a poet who, by fusing contrasting precursors into his own temperament, has made a book that emerges as entirely John Foy. The word ‘faith’ shares its origin with ‘abide,’ both of these denoting trustful expectation. A poet with such keen powers of observation and an intelligence so piercing can move forward with confidence toward the work he is meant to do.